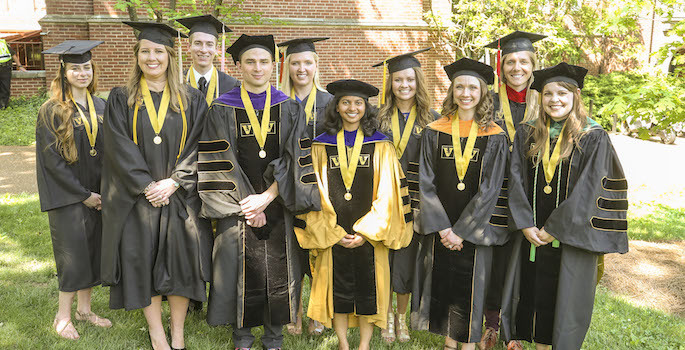 Vanderbilt University recognized the top-graduating student from each of its undergraduate and professional schools on Friday, May 11, during annual Commencement ceremonies. 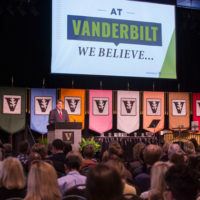 Chancellor Nicholas S. Zeppos presented the scholars with Founder’s Medals in honor of the university’s founder Cornelius Vanderbilt, a tradition dating back to 1877. Madison Caroline Renner, from Franklin, Tennessee, is Founder’s Medalist for the College of Arts and Science. She graduated with a bachelor of arts. Through her studies in environmental sociology, she explored a climate-adaptation movement led by women in North Africa who created a market for craft baskets. She also conducted research on how the American public’s views of climate change are shaped by the media. Renner was awarded a Vanderbilt Undergraduate Summer Research Fellowship and received the Outstanding Senior Award in Sociology. She plans to pursue a Ph.D. in sociology at Harvard University. Andrew Lee Sledge, from Garner, North Carolina, is Founder’s Medalist for the Blair School of Music. He graduated with a bachelor of music and received the George E. VanMeter Scholarship. Sledge served as principal with the Vanderbilt Orchestra and Wind Symphony. A finalist in the Vanderbilt Concerto Competition and a member of Pi Kappa Lambda, the National Music Honor Society, he received the Elliott and Ailsa Newman Prize for performance excellence. He studied with members of the Berlin Philharmonic and the Paris National Opera, and conducted summer studies in Aix-en-Provence, France, and Québec. Sledge will attend the Yale School of Music to pursue a graduate degree in bassoon performance. Crystal Marie Loehman, from Downers Grove, Illinois, is Founder’s Medalist for the School of Engineering. She graduated with a bachelor of engineering in chemical engineering and received the Dillard Jacobs Scholarship. Loehman has worked with hundreds of children through her work with Engineering for Kids and Code Ignite, spurring their interest in science, technology, engineering and mathematics. A first-generation graduate, Loehman has combined outreach and high academic achievement with service to the Vanderbilt community through four years on the Honor Council and two years as a resident adviser. Loehman will join Mars Petcare as a process engineer. Logan Elizabeth Brown, from Lawrence, Kansas, is Founder’s Medalist for Peabody College. She graduated with a bachelor of science and received the Chancellor’s Scholarship. Brown’s passion for the law in seventh grade led to an internship at her local district attorney’s office. As a human and organizational development major she researched counterterrorism issues and worked with military and law enforcement organizations. She won the Nichols Humanitarian Award, which enabled her to work with victims of human trafficking in England. A recipient of a 2018 Marshall Scholarship, Brown will pursue her master’s in terrorism, security and society at King’s College London. Kelsey Laine Davis, from Thousand Oaks, California, is Founder’s Medalist for the Divinity School. She graduated with a master of divinity. Davis had a successful sports career as goalkeeper with the United States Women’s National Soccer Team. While at Vanderbilt she worked with Thistle Farms–a nonprofit dedicated to helping women recover from prostitution, trafficking and drug use. She also served on the board of Street Child United USA, which serves homeless children through soccer. She was named a Harold Stirling Vanderbilt Scholar and a fellow in the Cal Turner Program for Moral Leadership in the Professions. She will pursue ministry in the Episcopal Church. Morgan Lea Flanders, from Peachtree City, Georgia, is Founder’s Medalist for the Owen Graduate School of Management. She graduated with a master of business administration and received the Bruce D. Henderson and E. Bronson Ingram Scholarships. Flanders entered the MBA program at Owen as a Dean’s Scholar and Forté Fellow and graduated with concentrations in strategy and operations. She was president of the Strategy and Consulting Club, which gave her opportunities to mentor first-year students. Flanders has joined Deloitte as a senior management consultant. Richard Turner Henderson, from Nashville, Tennessee, is Founder’s Medalist from the Law School. He graduated with a doctor of jurisprudence. He made the Dean’s List all semesters, earned the Archie B. Martin Prize for the highest average for the first year and the Robert F. Jackson Award for the highest average after two years. Henderson served as the notes editor for the Vanderbilt Law Review and received the Myron Penn Laughlin Award for the best published student note. Additionally, he was the articles editor for the Environmental Law and Policy Annual Review. Henderson has joined Bass, Berry & Sims in Nashville as an associate. Thushara Gunda, from Alexandria, Virginia, is Founder’s Medalist for the Graduate School. She graduated with a doctor of philosophy in environmental engineering. In her graduate research, Gunda examined the complex factors influencing farmer decision-making in Sri Lanka. She enjoyed sharing her work with elementary and middle school students, and founded the annual Engineering Day event, which brings students to campus for a day of hands-on engineering activities. Gunda lives in Albuquerque, New Mexico, where she is conducting research at Sandia National Laboratories. Brenna Danielle Gillis, from Mount Juliet, Tennessee, is Founder’s Medalist for the School of Nursing. She graduated with a doctor of nursing practice. 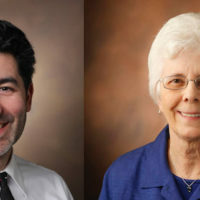 During her time at Vanderbilt she worked with nurse-midwives to standardize and strengthen their process for educating pregnant women about perinatal depression. In addition to volunteering on campus and in the community, Gillis earned 4.0 GPAs in both her master’s and doctoral programs at Vanderbilt. Now a certified psychiatric–mental health nurse practitioner, she provides mental health services to children, adolescents and adults. Whitney Elizabeth Muhlestein, from South Pasadena, California, is Founder’s Medalist for the School of Medicine received the 1984 School of Medicine Class Scholarship. She graduated with a doctor of medicine. Mentored by Vanderbilt University Medical Center Assistant Professor of Neurological Surgery Lola Chambless, Muhlestein chose a career in surgery. She co-directed the student-run Shade Tree free clinic and was inducted into the Alpha Omega Alpha and Gold Humanism honor societies. She will complete an intern year in general surgery at Wake Forest.